When attaining the rank of "fry cook", your employees can prepare anything on the menu. I can order hush puppies by the dozens. If I don't feel like fish....I can always turn my head 10 degress to the east and order from the KFC menu. My basket of "fried stuff" literally includes little chunks of "fried stuff" in the bottom. Am I literally dipping crusty solid oil into cocktail sauce for ingestion? You betcha. I can eat my fill of greasy fish and bread for less than 8 bucks. Spend any more, and you've just purchased a family pack. Long John Silver's (LJS for those of us who have the tattoo) has come up with a new item to keep my taste buds and gastrointestinal system aflame. It is revolutionary...so exciting....Fried Shrimp!!! Oh...they already serve fried shrimp? No...this is the new crispy Panko shrimp. I'm sure you're asking why the Price is Right is sponsoring a new food item at LJS? Alas, that is Plinko...not Panko. I ordered the Panko shrimp as part of a combo meal. For $4.99, I got 5 shrimp, 2 hush puppies, fries, and a small drink. More than enough food for a growing (waistline) boy like myself. I was pleasantly surprised at the texture of these shrimp. The crispiness content was higher than the normal soggy saggy shrimp you're used to getting at LJS. The shrimp are larger than expected, and I was pleasantly full after the meal. The taste of the shrimp is good, but not outstanding. They serve a spicy chili sauce for dipping, and it complemented the shrimp well. I would recommend the Panko shrimp to anyone who likes fried shrimp, or visits LJS frequently. It is a notch above their normal fried shrimp, and for $4.99 is much cheaper. I give the Panko Crispy shrimp 4 oily stars. 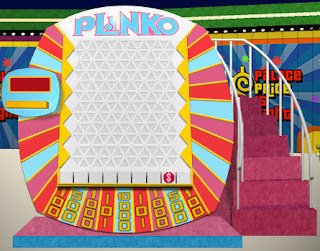 By adding a small Plinko game in a kids meal, they would have sealed the deal to a 5-star rating. As an aside -- The hush puppies are a modern miracle of physics. They are so heavy. Not quite a noble gas, the hush puppies have to rival Astatine in atomic weight. If you were involved in a hostage situation in the LJS, you could use these things as weapons. 2 well placed puppies to the forehead of an assailant would cleanly knock them out.